The patent on sticky-notes apparently expired in the 90s, some time before UX took off. That’s 3Ms loss, as user research consumes vast quantities for collecting and visualising_data. What to do with a great mosaic of comments ? 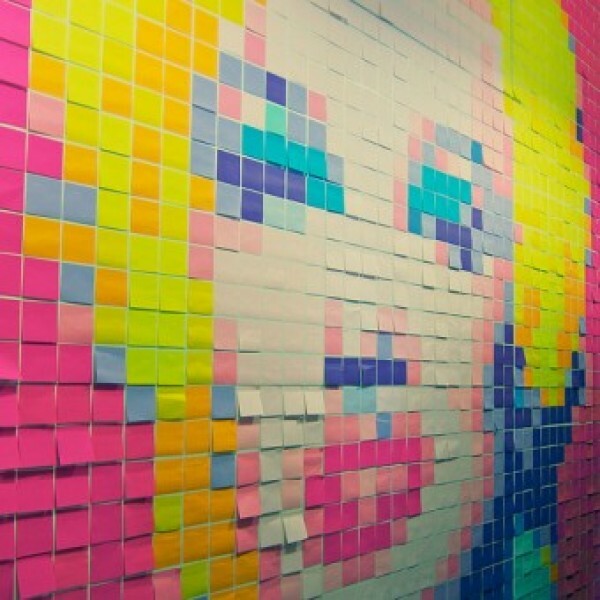 A wall of sticky notes that’ve been so carefully written, sorted and arranged, that represents a productive, collective experience, can be difficult to work with later. When left up for too long, they becomes invisible, overlooked, giving the impression the work has not progressed and the information is no longer referred to. But photographing makes the data even less accessible and meaningful. Walls of stickies can become albatrosses, flaking remnants of yesterday’s workshop which no one feels empowered to take down. is to digitise the data by collating it into a simple spreadsheet or database. Even when statistical analysis isn’t possible, digital is arguably more accessible, durable and suited to analysis. On the example below, the number of times the same comment was made (top x-axis) is represented by font size. e.g. ‘Work Experience” (mentioned by 12 people), has text proportionately larger than “university visits” (4 ). This format, used to present the output of a large workshop, then visualises the extent to which attendees agreed with different suggestions. Further information comes from the y axis which groups responses by benchmarked activity. Another version, here summarising some of the outputs from a discovery phase, presents stakeholders on the y, and the stages of a process along the x axis, with anecdotal comments being positioned according to who made them. The poster is a flexible format that doesn’t always require graphic design.